What can you tell us about your new release, The Rookie and the Rockstar? 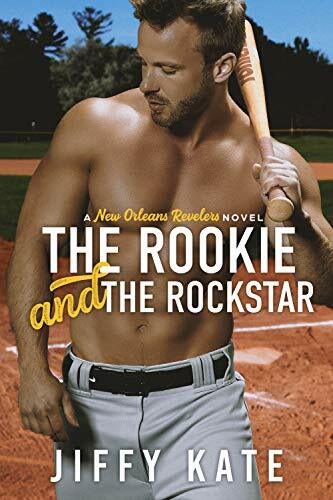 The Rookie and The Rockstar is our first sports romance. We love baseball and have always wanted to write a story based around the sport. Charlotte “Lola” Carradine is all too familiar with the paparazzi, but nothing can prepare her for what life will be like dating one of MLB’s hottest rookies. Making it to the Big Leagues has been Bo Bennett’s lifelong dream. When he finally gets his break with the New Orleans Revelers, the last thing he needs is a distraction, but Charlotte isn’t just rocking the stage, she’s rocking his world. So many people and circumstances played a part in our journey to publishing. We both have always loved the written word, dabbling in writing blogs and keeping journals over the years. When we met in the Twilight fandom, about seven years ago, we decided to try our hand at writing fanfiction, assuming we’d write one story and get it out of our system. That was the biggest lie we’ve ever told ourselves. LOL. Over the course of a few years, we wrote more than twenty stories. We developed our voice and wrote about the characters we loved. We also watched people come from the world of fanfiction and have great success, so we eventually decided to take the leap in 2015 and we published our first book, Finding Focus. The rest is history. If we had to narrow it down to one person who really made a difference in our lives and inspired us, we’d have to say, Stefenie Meyer. Because of her dream, we’re now chasing ours. Everyone knows that giving Jiffy Kate the mic is very dangerous. But if we ever get the chance, we’d love to interview Stephenie Meyer and grill her about Midnight Sun. Ha! Actually, she might hate us if we did that and we’d want her to love us, so we’d probably just ask her if she’s had any new dreams and what book she’s working on next. The characters. We love coming up with colorful, soulful people to write about. We both work. (Jiff is in the classroom all day and Jenny Kate is an accounting assistant.) But we also try to squeeze in some writing whenever and wherever we can, mostly in the evenings and weekends. What scene in The Rookie and the Rockstar was your favorite to write? Without giving too much away, we’ll just say that we love one of the opening scenes where Bo and Charlotte go to a crepe truck for a late night snack. Their conversation is easy and they don’t even know each other yet. It’s a great glimpse into what’s to come for the two of them and sets the tone for their relationship.